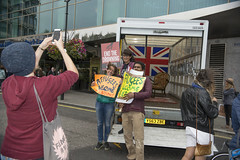 Artist Alketa Xhafa Mripa took this dynamic installation to the Refugees Welcome Here demonstration in September 2016, inviting members of public into the back of her van to share stories and reflections on the theme of welcome. 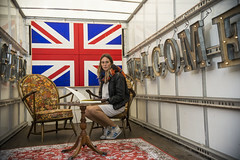 Alketa, who is originally from Kosovo, drew on memories of her own welcome to the UK in creating the installation, which she hopes will also provoke questions about the welcome received by refugees today. ‘Refugees Welcome’ is commissioned by Counterpoints Arts and had its debut at British Museum as part of Refugee Week 2016. See how visitors reacted to the installation in this short video.